Lyemance dampers are an industry icon and may well be the most widely installed top-sealing, energy-saving dampers in America. Lyemance dampers have been manufactured since the mid 1970s and are the very first top sealing chimney damper in the industry. Lyemance dampers are made with a silicone rubber gasket that seals them as tightly as a mason jar to prevent warm air from escaping up the chimney, saving households hundreds of energy dollars each year. Their indestructible cast aluminum frame will last a lifetime. Lyemance dampers even include an easy open power level assist to assure proper operation no matter what the conditions. 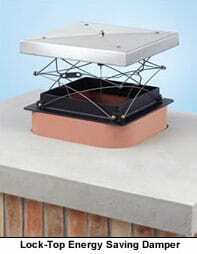 Plus, their low profile is ideal for homeowners who want to maintain the authentic look of their masonry chimney. Naturally, Lyemance dampers come with a lifetime warranty. Damper seals with a rubber gasket, not metal to metal. This is the perfect location to create an airtight seal. A cable drops down the flue and attaches to a handle. The handle is mounted in the firebox to be easily reached for convenient opening and closing. Lock-Top energy saving dampers provide another choice in top-sealing damper technology. The pop up lid assures that maximum flue size is maintained when damper is open and provides superior weather protection. 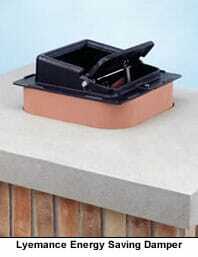 The silicone rubber gasket seals very tightly to minimize the loss of hot or cool air through the chimney. Manufactured since the late 80’s, the Lock-Top energy saving damper is manufactured to the same stringent standards applied to all Gelco products and comes with the same, no-nonsense Lifetime Warranty. When your chimney isn't working, you need to call someone who isn't just blowing smoke; contact Chimney King Enterprises Inc. for all of your chimney service needs! ©2018 Chimney King Enterprises INC – All rights reserved.